PROJECT SUMMARY: This project began with a vision from our clients. Their desire was for a backyard “fully loaded” including a pool, hot tub, pond, patio, seatwalls, plantings, and of course outdoor landscape lighting. After a lighting consultation and assessment, these clients felt confident in Southern Lights lighting design capabilities. Backyards are always fun to work with and this home didn’t disappoint. Pool, patio, landscaping, walkways, and architecture. A landscape lighting designers dream…lots of opportunities to create a one-of-a-kind lighting design. Elevation changes close to the pool made for a real safety hazard, so a proper fixture was needed to provide enough light in the area without blinding guests hanging out in the pool. Southern Lights was able to located and install the perfect solution and the perfect fixture for the area. LIGHTING FOCUS: Illuminating the homes architecture was first on the “to do list”. Once the backdrop of the home was lit, we moved out into the landscape illuminating the elevation changes and perimeter around the pool. There were so many areas of interest, the focus became creating a well balanced lighting design giving the clients and their guests a jaw dropping experience. When talking with our clients, Southern Lights always tries to listen for what’s most important from our client’s perspective. In this case and in our company motto of (Safety. Security. SERENITY), Serenity played the largest role in this lighting designs focus. LOCATION: The lighting designs and installation for this project can be found in Oak Ridge, NC 27310. LIGHTING DESIGN: Ideal landscape lighting should evoke Safety. Security. SERENITY and should always start with a design. 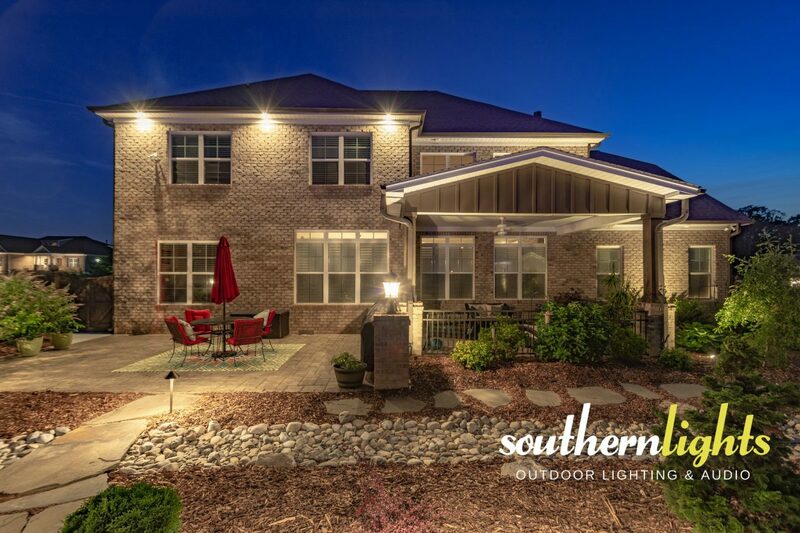 Realizing early on that this property and landscape really needed the full attention of an expert landscape lighting designer allowed Southern Lights the ability to be creative and deliver a high quality lighting installation. Existing paver patios, walkways, and an extensive landscape had its challenges. Working around hardscapes can create be difficult without experience in these fields. Southern Lights has over 23 years of working in and around landscape and hardscape environments, so although these areas take a little more time to work in, our experienced crews know how to work in and around these difficult obstacles.